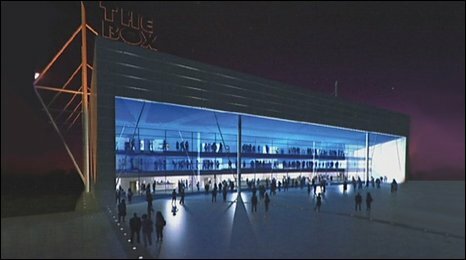 Competing bids to build an indoor 15,000 seater music and sport arena in Bristol have been unveiled. The plans, put together by rival developers, comprise building it close to Temple Meads railway station or near Bristol City's proposed new stadium. The council says by having the arena and football ground in the same place, transport plans could be shared. But architect George Ferguson - backing the Temple Meads plan - said the Ashton Vale site would be too car-dependent. Councillor Simon Cook, deputy leader of Bristol City Council, said having the venue next to the football ground made sense. "It would be very compatible because it can use the same infrastructure, the same transport plan - the bus rapid transit is going around the stadium with a commuter line straight into the city," he said. "Everything is there for the arena to make sense." But Mr Ferguson disagreed and said an arena that depends on thousands of customers driving to it would be a "dinosaur model". "To a certain extent that would be the model of one set next to the A370," he said. His plan involves land close to Bristol Temple Meads train station, which is close to where similar plans fell through several years ago. Mr Ferguson said this venue would be a bigger development of land around the station, which includes the old Royal Mail Depot. Bristol City FC, who have hosted music concerts at Ashton Gate, have not commented on the idea of the arena alongside their proposed new ground at Ashton Vale. Currently, the city's biggest music venue is the Colston Hall, which can hold about 2,000 people.